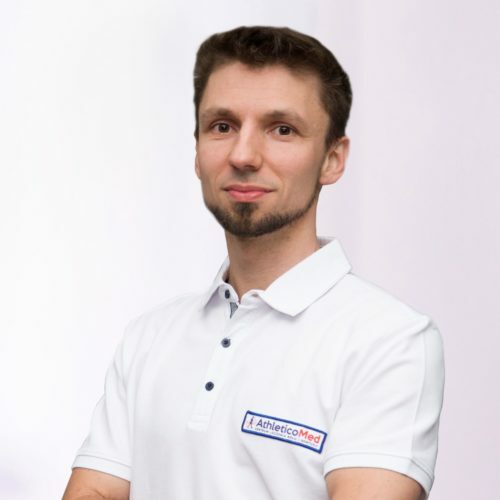 Marcin’s history as a therapist started in 2009 when he graduated his physiotherapy studies with a master’s degree. In 2015, he finished 4 years post-graduate work with a physiotherapy specialization. In his clinic, he used many different therapeutic methods- from neurokinesiology, functional movement, reflectoric locomotion, soft and hard manual therapy until discovering soft tissue and fascia therapy. There was one question that he tried to answer from the beginning of his studies: how tension and stiffness in one area can have an impact in different places? This question lead him to an Anatomy Trains workshop in 2013. After attending, he, surprisingly, started to have more questions; ‘Am I doing with my functional therapy what I think I am doing?’ ‘Does this movement really reduce disc protrusion like I was taught, or maybe releasing tension on psoas muscle is what helped my client?‘ As he found soft tissue manual work (in holistic and tensegrity aspects) so effective, he decided to become an ATSI structural integration therapist. Marcin also started to work as an academic teacher in 2010. He has been teaching Nicolaus Copernic University students how to be good and effective therapist. He has spent thousands of hours class teaching inter alia of diagnostic methods in sport, soft tissue therapy, manual therapy, clinical orthopeadic physiotherapy, massage and special physiotherapy methods has made him a very experienced teacher with a scientific way of thinking. Fascinated with his patients’ problems and the biomechanical aspect of the human body, Marcin also finds time for his three daughters and great wife, who is also a physiotherapist and forgives him his home absence.